People in organizations face a lot at work everyday. 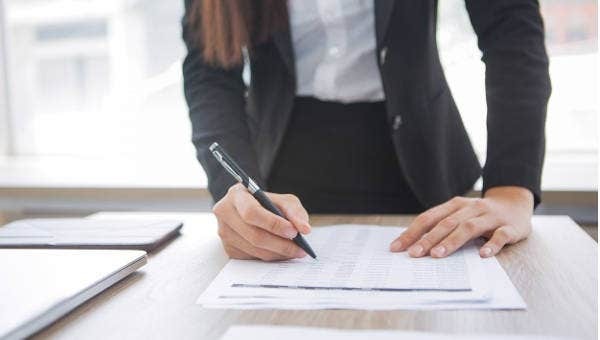 There are deadlines to meet, products to develop, or services to render, increasing pressure that tends to diminish the efficiency in a person’s performance in the organization. In order to attain a much healthier and motivated working environment, people need time to take a break and bond away from the demanding workplace. This is what organizational retreats are for. In order to attain a satisfactory retreat for your group, a good outline of activities is must-have. 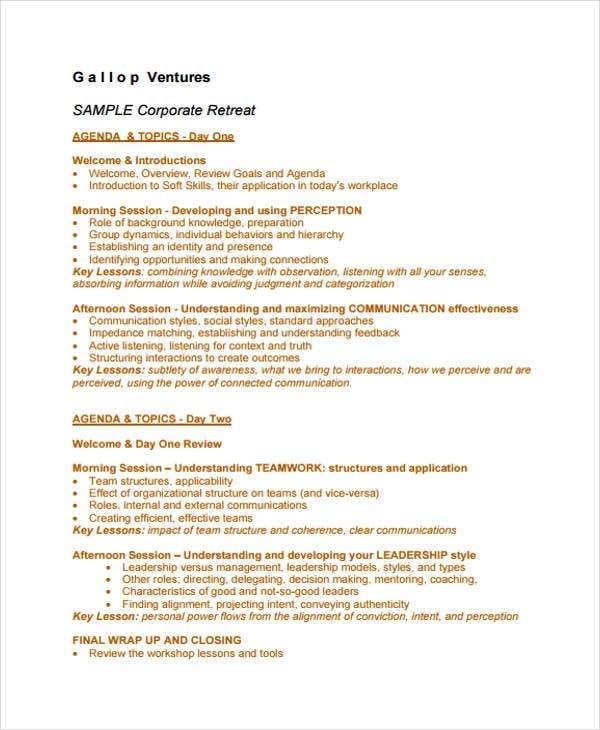 We give you sample Retreat Agenda Templates as well as other types of agenda templates as well as tips for meeting agendas and executive retreat itinerary agenda on our website for you to choose and download. 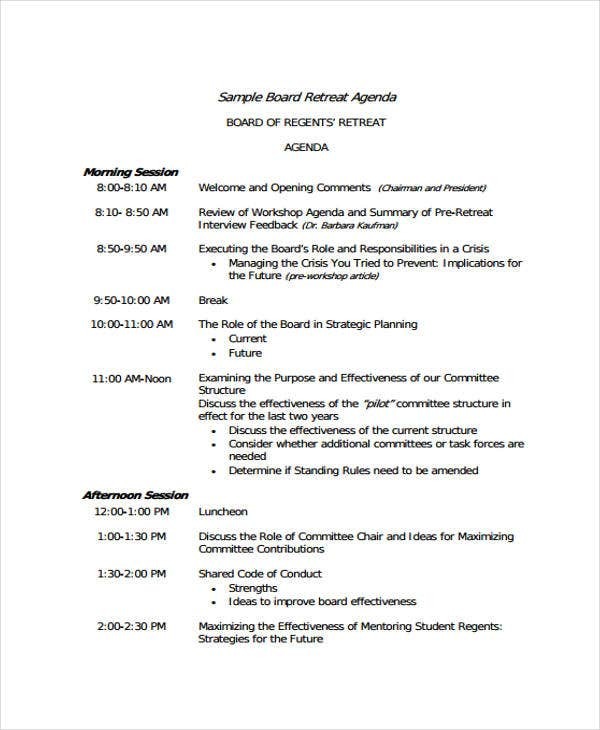 A retreat agenda is an outline of the activities for the group of people designed to refresh their minds on the organizational goals and ideals. Aside from that, there are activities for the people to bond and to discuss organizational issues and problems. The agenda comprises the time frame and its respective planned activities and sessions including the time for breaks. This well help the facilitator and the people participating in monitoring where exactly are you at or what you are tackling on the day of the retreat. 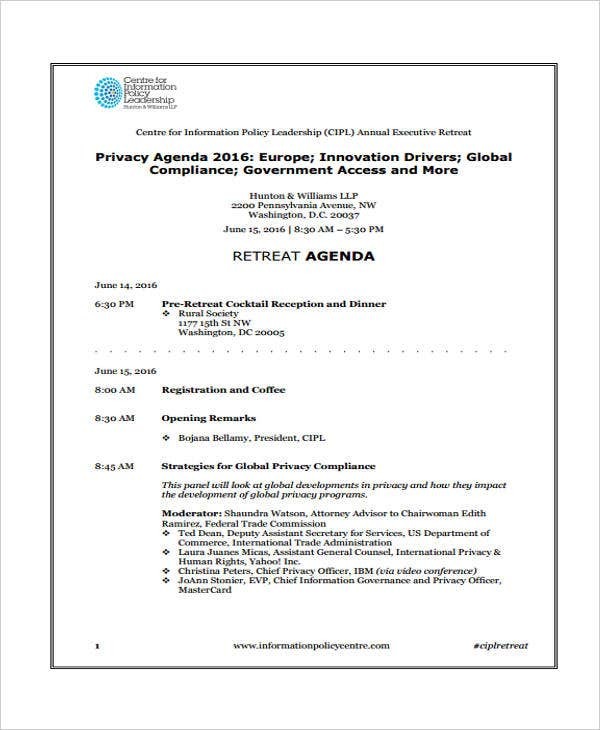 You can browse through and download from the sample retreat agenda templates provided in this list. 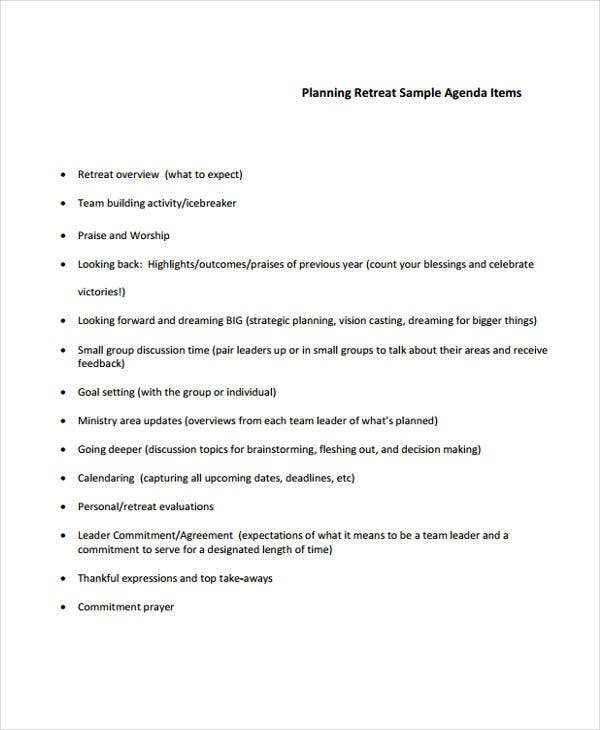 Organizers for managerial training can also make use of leadership agenda samples for managerial retreat sessions. 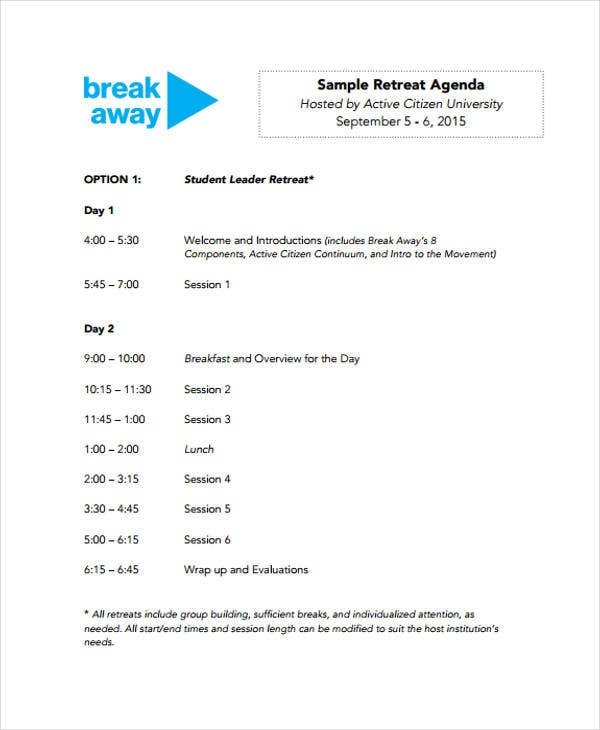 Why Do We Need an Agenda for Retreats? 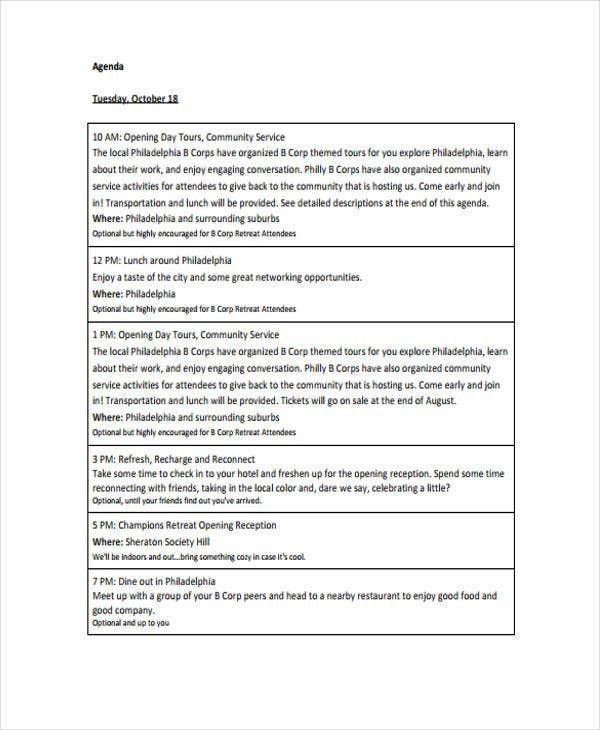 In order to organize the activities that will happen within the day, you might need agenda templates in PDF. Note that it is important to have a well-designed combination of different types of activities in order to have a successful and productive retreat. You can have interactive group discussions, play team games or simulations or a mixture of those kinds of activities. This will help participants to be active that would make them contribute greatly from one retreat activity to another, moving your group to achieving the goals you set for your retreat. 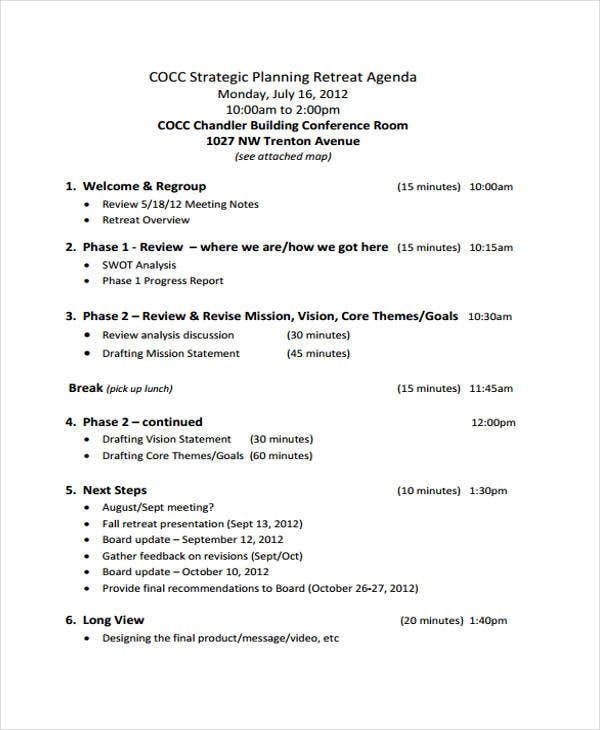 An agenda can be finalized four weeks or more before the day of the retreat. 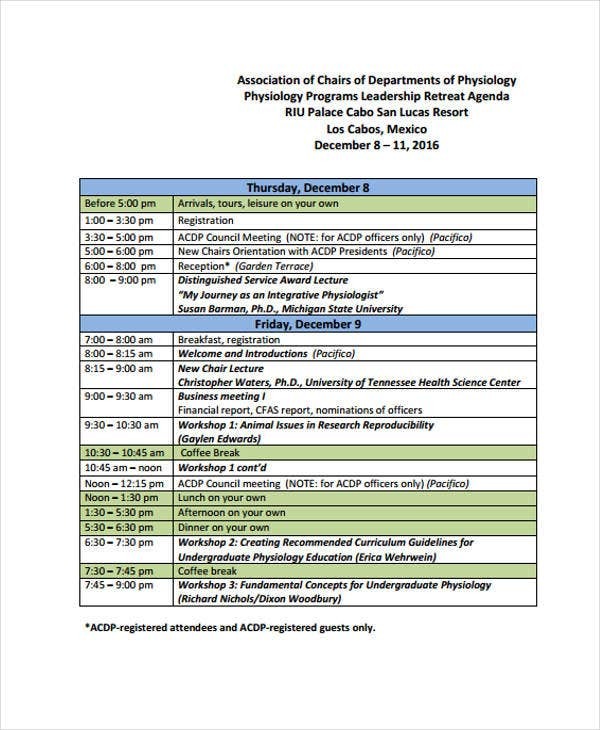 This will be useful in determining what your goals will be, who the participants are, and other factors regarding the retreat. 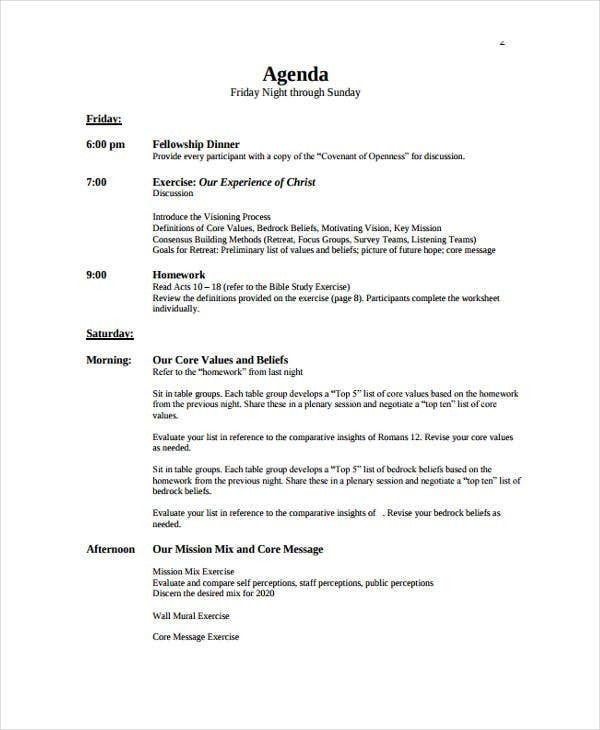 Aside from retreat agendas, you may also want to check our leadership agenda templates in our website. What is the purpose of this retreat? The retreat may not be set to only one purpose. It may be two or more depending on the issues of the organization. Carefully identify the retreat purpose for this is the basis for the entire retreat agenda. 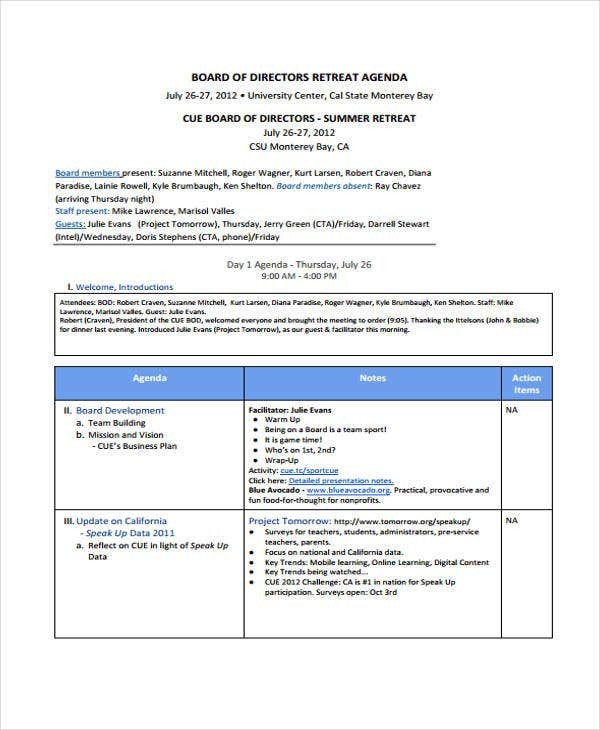 Retreat facilitators for nonprofit organizations may need nonprofit agenda templates to organize them. Who needs to attend the retreat? The participants of the retreat depends on the purpose. 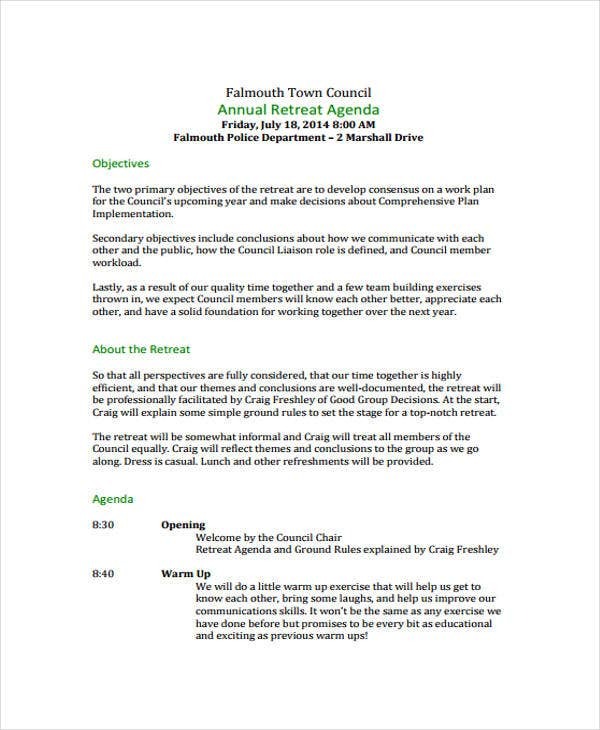 Those involved should be the ones attending, be it a small or a large group. You can hire an outside facilitator to lead the retreat or you can assigned someone in your group to take the task. What is the agenda? The activities for the purpose of the retreat are made in this part of the planning. You can brainstorm and have a planning committee. You can refer to these agenda planner templates and these annual agenda templates to get you started. Where will the retreat be held? Retreats are usually done away from the normal workplace. But you can opt to stay in your office to avoid much work in the preparation. People tend to be more productive and more motivated to do day-to-day tasks after taking a short break. Having an organizational retreat with a well-designed retreat agenda will aid you in taking the right track and achieving the goals and interests set by your organization.